The East side of Churchill Square. For-profit businesses fall into two categories of sales: they offer either goods, services, or a combination of the two. “Goods” are defined by dictionary.reference.com as “articles of trade; wares; merchandise.” These are physical items that you can purchase from a store. “Services” are defined as “the supplying… of utilities or commodities” or “the providing… of accommodation or activities required by the public.” In other words, businesses that provide services will assist you or do things for you in exchange for payment. Businesses which provide goods include grocery stores and fast food restaurants where you go to a counter to order food and then bring it to a table yourself. Businesses which offer services include hair salons or financial institutions such as banks. Some businesses offer both goods and services, such as restaurants with table service. You pay for the food, but also for the staff to cook it and bring it to your table for you. In the past, some higher end stores offered services such as personal shopping and home delivery which do not necessarily still exist today. However, some business which formerly offered only services have expanded to also sell goods, such as hair salons which sell products that you can take home. An add for Ayre’s Grocery Store from 1971. In 1971, there were 35 businesses in Churchill Square which were available to the general public. 10 of these businesses offered goods, 18 offered services, and 7 offered a mixture of the two. This means that 51% of the businesses in the square were strictly offering services. In 2015, there are 59 businesses in Churchill Square which are open to the general public. 19 offer goods, 24 offer services, and 16 offer a combination of goods and services. This means that 41% of the businesses offer only services. Services still represent a majority of the types of businesses in Churchill Square, but they have decreased. Now, 27% of businesses offer both goods and services. This is a reflection of the number of businesses which have expanded from offering only services to offer both goods and services. For example, The Hair Factory is a high end beauty salon and spa, but they also carry beauty products, handbags, and accessories for sale. There has also been a slight increase in the number of goods for sale. This may be a reflection of the increase in fast food restaurants, such as Tim Horton’s, Subway, and Big Bite Pizza. Also, some businesses which used to offer services traditionally have changed to mainly self-service. This applies to gas stations where you now pump your own gas, or clothing stores where you choose items and try them on yourself. 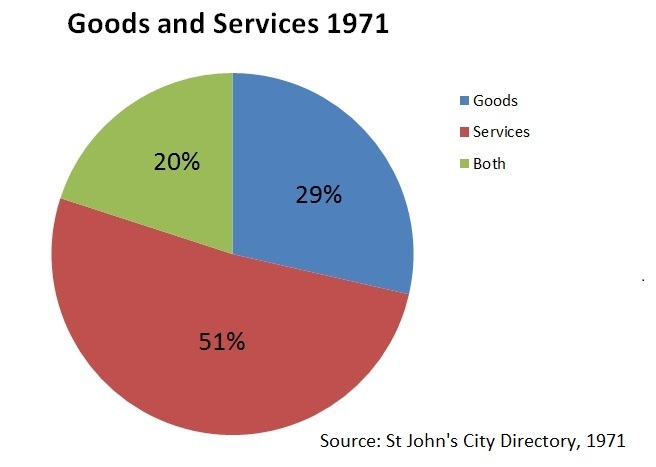 Graphs of the number of businesses which offered goods, services, or both in 1971 and 2015. Scotiabank and the abandoned Ayre’s store. There are many services and items that a person could purchase within Churchill Square and surrounding area, but there were some that you did have to go elsewhere to get. In 1971 you could purchase groceries, liquor, stationary, and women’s clothing. Services available included dentistry, optometry, pharmacies, a laundromat, a restaurant, bars, salons, barbers, and banking. Some things which were not available in Churchill Square included doctor’s offices, men and children’s clothing, and furniture shops. These services could be sought in the Avalon Mall or in the downtown area. Today, there are plenty of things a person can purchase in the area without having to go elsewhere. Goods and services within Churchill Square in 2015 include restaurants and cafés; a fitness store; fast food restaurants, various medical services such as optometry, dentistry, and pharmacy; law offices, banks, wellness services, dry cleaners, an outdoor store, a children’s fashion store, a small ladies boutique, jewelry stores, hair dressers, and banks. There are more medical services available now, including a cardiologist and several eye surgeons, but for some basic items like, groceries, furniture, and appliances, you need to shop elsewhere. There is a dry cleaners but not a laundromat so it is difficult to wash clothes if you do not own a washer and drier. In 2015, there are more specialized services available in Churchill Square than in the past, but for some basic items such as food and alcohol, you need to go elsewhere. These days, people can shop not only in the Avalon Mall and downtown, but also in big box stores and a wider array of grocery stores. The East side and a side view of the main building. 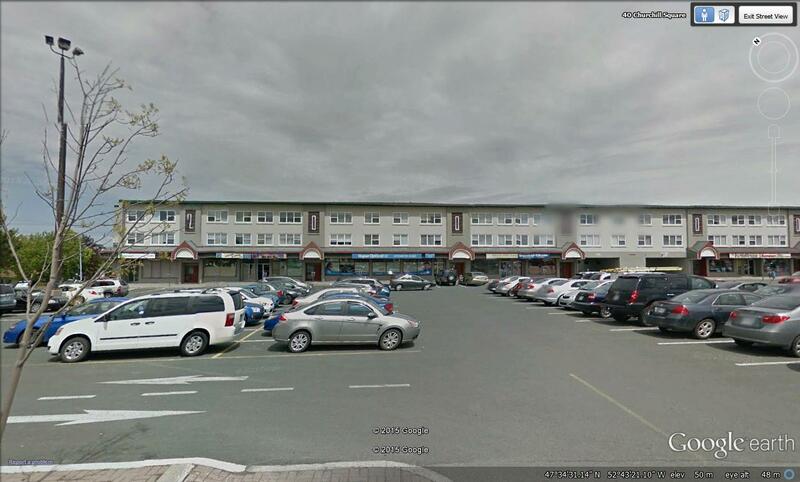 The number of businesses located in Churchill Square has increased from 35 to over 50, providing residents of St. John’s and surrounding areas with goods and services across many spectrums. In 1971, long before the influx of chain stores to Newfoundland there were 32 locally owned and operated stores and businesses. This was 91% of what was offered in Churchill Square. 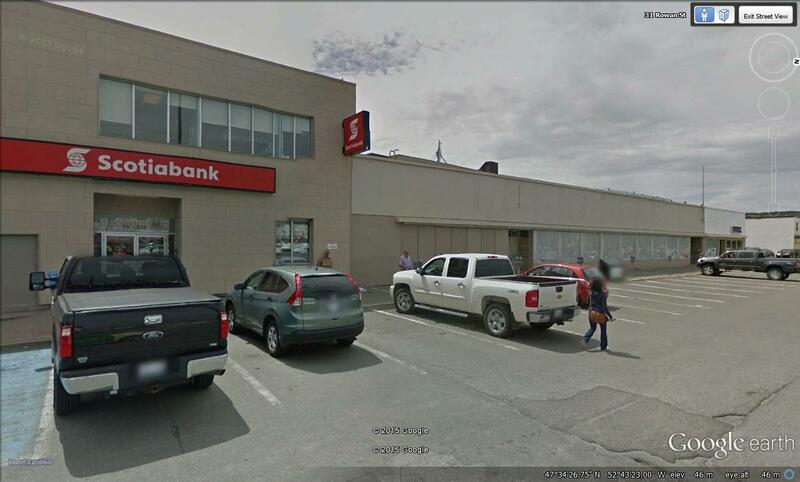 The three services that were part of a larger chain centered on banking and financing including CIBC and the Bank of Nova Scotia. In a comparison to the present day the number of locally owned and operated stores greatly outnumber chain businesses. Forty-four or 75% of stores are local ones. This consists of restaurants such as Pasta Plus and Living Rooms Café; clothing stores like Take the Plunge and C’est Moi and medical services such as Dr. Hiscocks Optometry, Arthritis and Brace Center, doctor’s offices, OBGYNs and cardiologists. 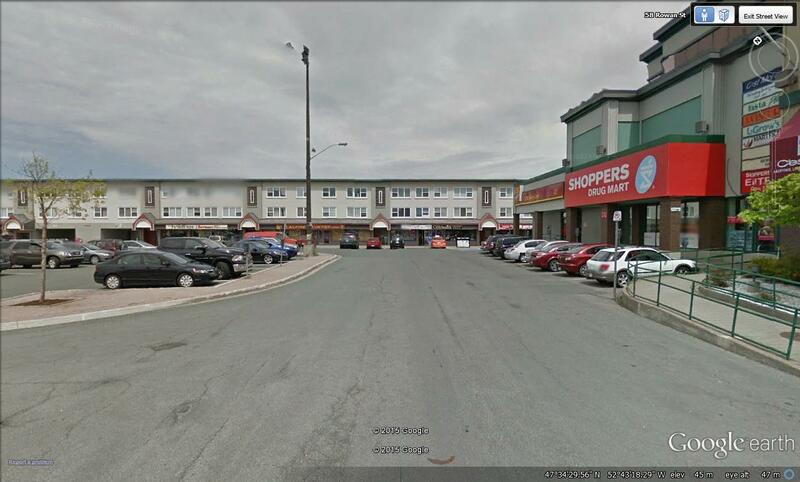 Also included are stores such as Studio Maxx and Diamond Design who have multiple locations throughout St. John’s and Newfoundland but still are operated by locals in the community. Chain stores in the area offer food services such as Pizza Hut, Tim Horton’s and The Rocky Mountain Chocolate Factory. Also offered are financial services like Scotia Bank and medical chains like Shoppers Drug Mart and Orion Health Ltd. 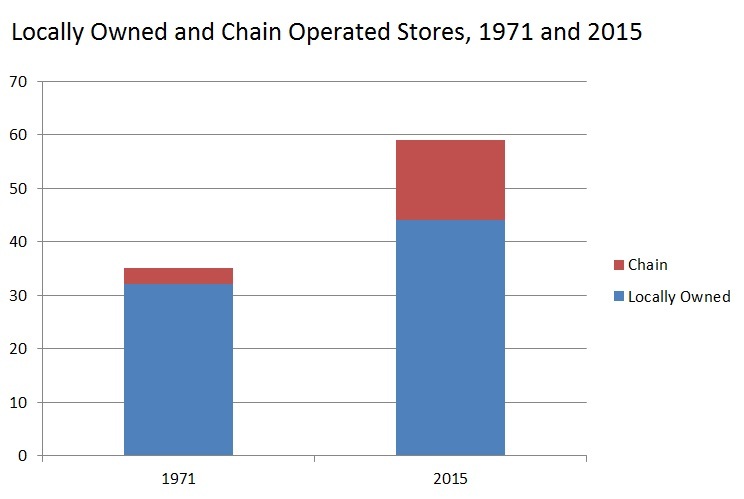 The number of locally owned stores and businesses is much larger than those operated by corporations in a chain, both in 1971 and 2015.